A little bit sweet and a little bit spicy, these Brown Sugar Sriracha Bacon Bites are the easiest appetizer recipe. Plus, they’ll disappear fast because they are so popular! Preheat the oven to 325ºF. Line 2 baking sheets with foil, then place a cooling rack on top. Spray generously with nonstick cooking spray. Combine the Sriracha and the brown sugar in a medium bowl. Add the bacon and stir to coat each of the pieces in the mixture. Place the bacon pieces on the prepared baking sheets in a single layer. Bake the bacon until almost crisp, 30-45 minutes. 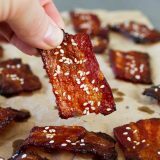 During the last 5 minutes, sprinkle the sesame seeds evenly over the bacon. Remove from the oven. Cool for 5-8 minutes, moving the pieces every couple minutes to prevent them from sticking to the rack. The bacon will crisp more as it cools.